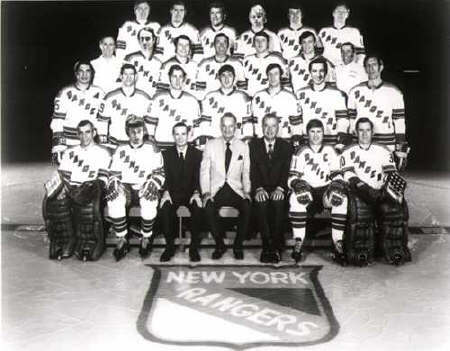 Game’s 1, 2 and 5 all went to overtime and the 7th-seeded ’71-’72 New York Rangers were the winners in all three. That went along way to winning this series as they just barely edged out the 26th-seeded ’05-’06 Ottawa Senators 16-15 over the course of the five games. Neither offense played all that well and for the ’71-’72 Rangers, only five players score more than once. Vic Hadfield was their leader in goals with four while there was a four-way tie for second with two goals between Rod Gilbert, Ted Irvine, Jean Ratelle and defenseman Brad Park. Gilbert finished as the team’s top playmaker with four assists while Ratelle was tied for second with Bill Fairbairn with three assists. All of Fairbairn’s assists came in the Rangers’ 4-2 win in Game 3. Gilbert and Hadfield both finished with six points to tie for the team lead while Ratelle was a close second with five. Park, by the way, was ejected in the second period of the series-deciding Game 5 for spearing. Goaltender Ed Giacomin was pretty good for New York during the series. However, his final stats for the series won’t show it because the Senators were able to beat him 10 times in the final two games of the series. Overall, he posted a 4-1-1 record with a 3.00 goals against average and an .886 save percentage. The offense for the Senators was especially poor early on in this series. They scored just five times over the first three games, but scored 10 during the final two. Much like in the First Round, most of the goal-scoring for Ottawa came from Daniel Alfredsson and Dany Heatley. They both scored four times during this series to tie for the team lead. Patrick Eaves tallied three goals to stand alone in second and was the only other Sen to score more than once. Heatley was also tied for the team lead in assists at four with defenseman Wade Redden. Redden’s defensive partner, Zdeno Chara, was second in assists with three. Goaltender Dominik Hasek was much better than he was in the First Round for Ottawa. He posted a 1-1-3 record to go along with a 3.20 goals against average and a .920 save percentage, much better than his .874 percentage in the First Round. The ’71-’72 Rangers have represented the Original Six franchise in all three Ultimate NHL Playoffs. They are heading to the Third Round for the third time, but last year they were knocked out in the Third Round after making it to the Quarterfinal in the inaugural UNP. For the second year in a row, they will face the 23rd-seeded ’79-’80 Buffalo Sabres in the next round. The ’05-’06 Senators have also represented the second coming of the franchise in all three UNPs and have been able to get to the Second Round in all three. However, they have yet to get past this round and it has been the ’71-’72 Rangers for the second year in a row to be their downfall. Up next in the Second Round, the 13th-seeded ’74-’75 Los Angeles Kings face he 20th-seeded ’08-’09 Carolina Hurricanes! This entry was posted in 2nd Round, Ultimate NHL Playoff and tagged Bill Fairbairn, Brad Park, Daniel Alfredsson, Dany Heatley, Dominik Hasek, Ed Giacomin, Jean Ratelle, New York Rangers, Ottawa Senators, Patrick Eaves, Peter Schaefer, Rod Gilbert, Second Round, Ted Irvine, Ultimate NHL Playoff, Vic Hadfield, Wade Redden, Zdeno Chara. Bookmark the permalink.